With Star Wars opening to huge success in the United States, breaking records and making history across a memorable summer, the opportunity for companies and publishing houses in the UK to hop aboard the freight train was obvious and inevitable. In the UK as in the States, Marvel held the licence to publish Star Wars comics. The adaptation of the film had broken all manner of sales records since its release in the US. Anticipation and excitement was such that issue one sold a million copies, a record for post-war comics in an era when sales were badly slumping and the market was on the verge of implosion. In the UK the situation was much the same. Marvel UK was haemorrhaging money in alarming fashion and itself was on the edge of going under. A comics wunderkind called Dez Skinn was brought in by Stan Lee to innovate and pull the company from the brink. Eventually Skinn rose to the head of the company and for a time brought Star Wars under his control. From a company whose only tangible asset was the sub-licenced Star Wars comic to a successful and viable company, Marvel UK would be the home of Star Wars comics in the UK until the late 80’s, long after Return of the Jedi and Caravan of Courage had hit home video. The UK edition of the American comic was far more than a simple reprint. As was the fashion with UK comics the title was a weekly release, hitting shelves across the country every Wednesday. 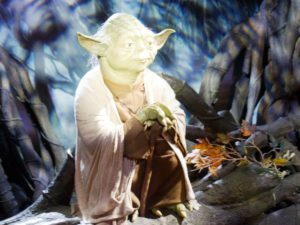 For 10p, kids could begin to learn about the characters of the film and access the action of Star Wars in a way that gave them the opportunity to chew over the many and various layers of the story. With art by Howard Chaykin and a script by writer Roy Thomas, kids could soak up the adventurous magic of the film, and then only wait another 7 days for the next 8-10 pages of story to arrive. And kids read, re-read and read again their weekly issues. Unlike today, that was pretty much all we had. As was Marvel’s common approach at the time, the title was supplemented by back up strips mined from the Mighty Marvel back catalogue. Tales of the Galaxy, Guardians of the Galaxy, Rom Spaceknight, Indiana Jones. These were just a handful of the many strips that packed out the pages of the title across the years, giving readers a deeper insight into the Marvel Universe that Star Wars peripherally sat next to. While the US issues gave a fuller account of the story and only featured Star Wars content, the weekly UK releases had to find other materiel, but kids of the time weren’t complaining. As Marvel UK grew stronger, kids found themselves diversifying and reading titles from Marvels superhero line. Win/win for Marvel. Marvel UK also featured original content separate from the US releases. Authors such as Alan Moore provided stories, drawn by artists including John Stokes. For years these were unavailable outside of the UK until Dark Horse collected them in their DevilWorlds title in the 90’s. While no longer canon, and certainly unique such stories as Flight of the Falcon and Tilotny Throws A Shape gave readers a uniquely British spin on an increasingly familiar and developing galaxy. In addition, competitions became a staple of the weekly title. Opportunities to win stationary sets, Super-8 clips of the films, Palitoy’s range of toys…kids were truly spoiled and entered by the thousands. Companies who advertised in the magazine got ‘the rub’ from Star Wars, sending kids to sweet shops to buy Fruit Gums, Texan Bars and Secret Agents. Being associated with Star Wars in the 70’s and early 80’s was big business. Skinn considered the title more of a magazine than simply a comic, so interviews and photospreads began to appear each week. From its earliest days the comic presented a Who’s Who with what would now be considered questionable canonical information but at the time was all we had, along with very fertile imaginations. As the title matured photo covers began to more regularly adorn the title, showing images rarely seen at the time. 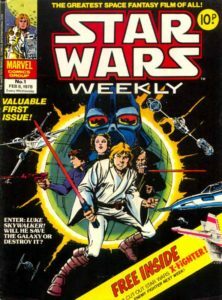 With the weekly title the only regular Marvel Star Wars release and no in-depth magazines on the market it gave the title chance to broaden its reach and appeal to older readers keen to know more about the rapidly expanding GFFA. As a part of the UK Star Wars experience the presence and importance of Star Wars Weekly can’t be underestimated. 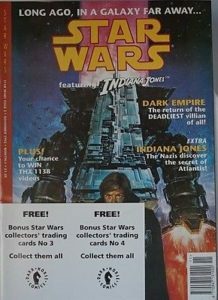 Morphing as it did into Empire Weekly, Empire Monthly, Star Wars Monthly and Return of the Jedi Weekly it gave kids a constant stream of content and information to distil and enjoy and fans were all the better for it. Mark was first caught in the Star Wars tractor beam back in late 1977, when Star Wars finally arrived in the UK. He launched Lightsabre in late June 1999 and after a decade as one of the UK's best known Star Wars sites merged with Jedi News in August 2010, where he is the co-owner and Daily Content Manager. He has written for Star Wars Insider since 2006 and has contributed to DeAgostini's Build The Millennium Falcon partwork as well as writing for Geeky Monkey magazine. He is an Honorary Friend of both the 501st and the Rebel Legion and is co-host of RADIO 1138 and Take Cover on the Jedi News Network.